Originally in Castleton, Webster's Sporting Goods is currently located at the intersection of 62nd St. and Binford Blvd. 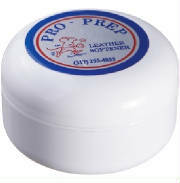 It is locally owned by Richard Webster, a retired Chemistry teacher who invented Proprep Glove Conditioner. Services and products are both offered and each customer is helped individually. Custom Design Team Uniforms, Shirts, etc. Ball pumps - for soccerballs, basketballs, etc. Graduatoin giflts - towels, blankets, etc. Acts as a softener, cleaner, conditioner, restorer, scuff resister, and water proofer.